NES Gimmick! (JPN) "100%" in 09:59.63 by Sami. 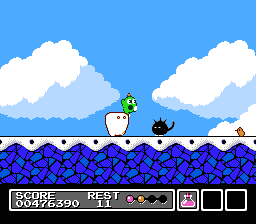 This is Sami's second take on Gimmick!, a short Japanese game about a small green creature who can summon stars to help him defeat monsters and to use them as platforms to reach high places and travel fast. This movie aims to collect all the items to enter the secret 7th level after the level 6 boss. It accomplishes this about 56 seconds faster than the previous movie.